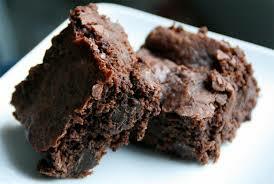 I’d never thought of putting black beans in brownies. A friend gave me this recipe. Everyone raves about it. Place the batter in an 8 by 8 pan. Put ½ cups chocolate chips on top. Bake 30 minutes at 350 until toothpick comes out clean. If you use a 9 x 13 pan, double the recipe.